RANA HUSSEINI - "A Question of Honor"
"The most satisfying thing for me is that I know I have saved someone’s life… I will never stop until the killing stops." 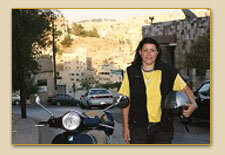 Rana Husseini has rarely shirked a challenge. She had planned an academic career after completing her studies in the United States, but her desire to do something for the women of her own country led her to return to her native Jordan with one aim: to fight discrimination against women. "The most satisfying thing for me is that I know I have saved someone's life... I will never stop until the killing stops." Nearly two decades later she is acknowledged as one of the Middle East’s most influential human-rights campaigners, the woman who exposed Jordan’s secret shame of so-called honour crimes. Husseini first became aware of the scale of what was going on when she was appointed crime reporter at The Jordan Times in 1993, a job that would not only change the direction of her own life, but that of her country’s. “I discovered these killers were getting away with very lenient sentences,” says Husseini. “Then I also discovered that women who survived these attacks were being put in prison at the women’s correctional facility in Amman for their own protection. I was outraged.” Husseini wrote a series of reports on the killings and launched a campaign to stop them. So began a lengthy campaign for justice. Through Husseini’s efforts, the taboo began to be talked about. Petitions demanding the cancellation of laws that discriminate against women received 15,000 signatures, and soon the Jordanian penal code was under the spotlight. As a result, she has been threatened and accused of being anti-Islam, antifamily, and anti-Jordan. Yet, Queen Noor took up the cause, and later, the newly ascended King Hassan cited the need for protection of women in his opening address to parliament. The conspiracy of silence has been forever broken thanks to this young journalist who risks her life in the firm faith that exposing the truth about honor killings and other forms of violence against women is the first step to stopping them. "We are proud to support these athletes who challenge preconceived notions about Afghan women through peacebuilding." The burqa boxers are coming. Young women are training in Afghanistan to fight in Islamic dress at the 2012 London Olympics. Wearing hijabs beneath their headguards and clothes that cover their bodies, 25 female pugilists are preparing for their bouts in gruelling training sessions at Kabul’s Olympic stadium, once the scene of public executions by the Taliban. The team, whose ages range from 14-25, were recruited by their coach, Fadir Sharify, a former professional boxer. He persuaded the girls’ families that it would not be inappropriate for them to take to the ring. The Afghan team is being sponsored by Oxfam as part of a project designed to promote peace and women’s rights. “In a country ravaged by 30 years of war and run by a conservative male-dominated society, these female boxers are Afghanistan’s most improbable ambassadors for peace,” Oxfam said. "If men can do it, then why can't I?" When she was widowed two years ago, most people in her Javanese village expected Nyai Yu Masriyah Amva to marry again. They also assumed that the local pesantran, or traditional Indonesian Islamic boarding school, would close with the death of her husband, its head Islamic scholar. What is more, Indonesia’s two largest Muslim political parties have intricate campaigns promoting women’s rights, and Indonesian feminists, male and female alike, have worked with progressive pesantran to develop women-friendly interpretations of shari’a. Feminism has found fertile soil in Indonesia. "It's a massive voice - not a single girl speaking alone". A new session unexpectedly stole the show at the 2009 World Economic Forum in Davos, Switzerland. Early on a Saturday morning - when most delegates would be expected to be sleeping - a panel called “The Girl Effect” played to a standing room-only crowd. A buzz circulated the packed room. It’s a simple concept whose time has finally arrived. Study after study shows that girls - more than 600 million strong in the developing world - hold the key to their communities’ successful future when they’re schooled and mentored in leadership. If it’s so logical, why hasn’t the world been investing in girls? Although many organizations that help educate girls and build leadership skills have emerged since the 1990s, the movement is only now gaining real traction, and successful girl-empowerment programs are now reaping what they’ve sown. At the close of that historic Davos session, World Bank Managing Director Ngozi Okonjo-Iweala called out to the audience. “Raise your hand,” she said, “if you now understand and believe in why we must invest in girls.” Everyone raised their hands. A mother protecting her child isn’t anything unique. 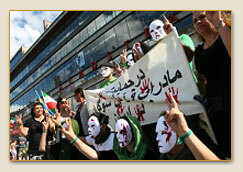 But in Iran, humanitarian activist mothers are now becoming global icons for human rights causes worldwide. In silent public protest, the ‘Mourning Mothers of Iran,’ known locally in Tehran as the ‘Mothers of Laleh,’ stand together each week, on Saturday evening vigils in Tehran’s Laleh Park. “I urge all women around the world to show their solidarity with the Committee of Iranian Mothers in Mourning by assembling in parks, in their respective countries, every Saturday between the hours of 7 to 8 p.m., wearing black,” said Nobel Peace Prize Laureate, Shirin Ebadi, in a plea made to women and activists worldwide. The Committee of Iranian Mothers use methods of ethics in non-violence to bring attention to the atrocity of their dead children. Over 200 Muslim women from 55 countries attended the Women in Islamic Spirituality and Equality (WISE) conference in Kuala Lumpur, Malaysia. 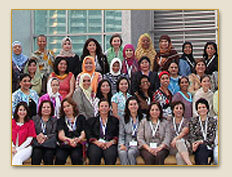 The focus was on educating and empowering Muslim women and promoting their rights from an Islamic perspective. Muslim women need to know that their religion gives them rights that their patriarchal culture often takes away. Malaysia’s WISE conference is helping demonstrate this. Educating Muslim women to understand that Islam itself grants them equal rights gives them the tools to effect change. At the WISE conference, attendees shared stories of effecting change in their various countries, strategies they used, and methods they found most valuable. 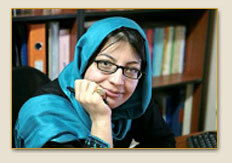 In her work as a lawyer, Ms Sadr defends women and human rights activists. In 2004, she set up Raahi, an organisation that seeks to improve women’s rights, by providing free legal assistance. In addition, Ms Sadr is campaigning to abolish the practice of stoning to death in Iran. For many years, she has been addressing taboo subjects such as domestic violence and bringing them out into the open, despite incurring personal threats. Her phone has also been tapped, she has been banned from leaving Iran, and has repeatedly been arrested and imprisoned. The Tulip Award will enable Ms Sadr to intensify her work as a human rights defender.